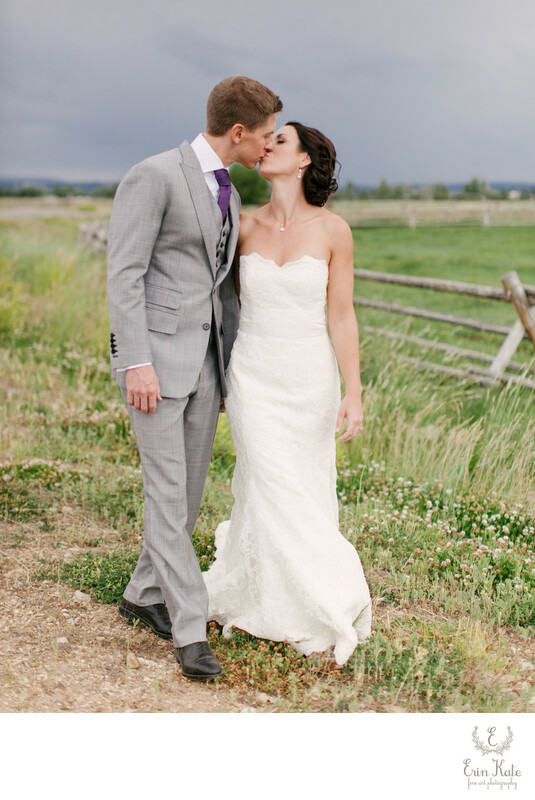 High Star Ranch in the Kamas Valley is such a lovely wedding venue. The grounds are home to a couple of historical structures and an amazing old tree that add so much charm to wedding celebrations. The General Store is a nice welcome for your guests as they arrive at the ranch. It is adorned with lovely flowers and a small silo. The old open-sided hay barn is my favorite structure and is used for small ceremonies and for dancing. In the far corner of the lawn is the one hundred year old tree which is a perfect spot for your ceremony. It sits next to the ranch's pond and shades you and your guests making summer weddings pleasant. Kate and Quinn decided to do a first look and complete all formal photographs before their ceremony. We took our time walking around the ranch for their photo session. The fields were green and storm clouds threatened in the distance. The dark skies made for amazing photographs and lucky for them it never rained that day. We found shelter from the wind in the hay storage barn. Their ceremony was held under the tree and guests were seated on wood benches. They walked down the aisle and crossed the lawn to their cocktail hour. Guests joined them by grabbing a cocktail at the bar by the General Store. The sprawling lawn hosted guests who were seated at farmhouse tables for dinner and toasts. Cake and dancing was held in the old open-sided hay barn when guests enjoyed music from the band and were treated to a gorgeous sunset. Location: 970 UT-32, Kamas, UT 84036.